Earth’s Mightiest Heroes are back for a thrilling, fun and–dare I say it?–darker film. While it doesn’t achieve the same feeling as its critically and commercially beloved predecessor, it’s a sequel befitting the model Marvel has created and a success in its own right. If you’re walking in to Age of Ultron expecting it to capture the same giddy feeling that came from seeing these favorite characters come together for the first time, you’re going to be let down. The Avengers was one of the most fun theater experiences I’ve had because of that feeling of freshness that came along with it; that feeling of childlike glee at seeing something bigger than yourself. Age of Ultron is suitably darker without being bleak, and it’s just as much of a good time if you like spending time with beloved and established characters without having to sit through the getting-to-know-you period. And yes, some of that childlike wonder remains wonderfully intact. After a being on the end of a disturbing dream, Tony Stark/Iron Man (Robert Downey Jr.) comes up with the idea to create Ultron (James Spader), essentially a shield for the world at large. However, things quickly go wrong, and Ultron decides that for peace to be had the human race must be eradicated. 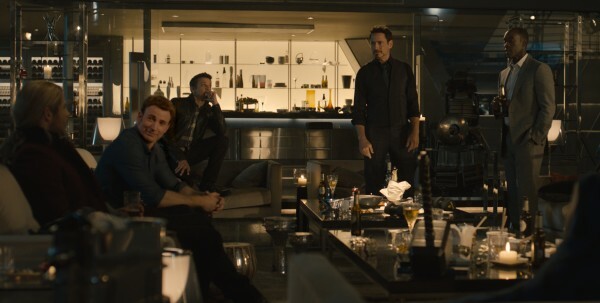 In their biggest challenge yet, Iron Man, Captain America (Chris Evans), Thor (Chris Hemsworth), the Hulk (Mark Ruffalo), Black Widow (Scarlett Johansson) and Hawkeye (Jeremy Renner) must put a stop to Ultron’s world-ending grand plan. The film also pleasingly hosts a number of supporting characters ranging from all across the Marvel board with new additions: Scarlet Witch (Elizabeth Olsen), Quicksilver (Aaron Taylor-Johnson), and Vision (Paul Bettany). Simply speaking, it’s a packed house. This both works for and against Age of Ultron, which begins to bear the brunt of the heavy load it’s carrying by the end of its two and a half hour run-time, even if the conclusion is wrapped up rather tidily. The faults in the film are obvious. It is, in a manner of speaking, the bridge between the set up and the conclusion of the story, meaning that much of the larger threats in the film are going to automatically seem redundant. A mega-lomaniac villain who views humans as lesser beings? That’s Loki in a titanium body. Inner team turmoil? That’s the entire second act of The Avengers. Hell, the catalyst to Tony building Ultron is a rehash of his fears in Iron Man 3 but on a greater and much more destructive scale. It’s unfortunate that the script had to rely so heavily on familiar narratives and character beats, but the inner character work, the often and surprising gorgeous cinematography and the actors’ chemistry more than makes up for it. The film is overstuffed, and while I don’t think it needed to be shorter, there needed to be a more singular and fluid line of how the characters were going to get from point A to point B without mucking about in what we’ve seen before. As I mentioned, the achievements of the film are so prominent that I have a hard time nitpicking, even if it’s a shame the film couldn’t achieve the filmmaking heights of the recent Captain America: Winter Soldier or Guardians of the Galaxy, both highlights of the Marvel Cinematic Universe. The actors are all well-accustomed to their roles at this point, wearing their alter egos like second skin. Jeremy Renner gets much more time to play around with Hawkeye’s characterization in this outing, showing a more aloof mindset that should please comic fans while also being a surprising emotional throughout for the film. Scarlett Johansson also does remarkably good work as Black Widow, continuing to make me wonder why she hasn’t lead her own solo movie yet. She and Ruffalo share a sweet, uncharted chemistry that gives both substantial material to work with. These three get to hold down the more personal and emotional storylines of the film, while Elizabeth Olsen’s Scarlet Witch bursts in and cements herself as a welcome addition to the ensemble. Downey is once again a figurehead of the film, providing the necessary gravitas without losing his trademark snark. If any characters feel the brunt of the overstuffed stage, it’s Thor and Captain America, both who have small moments to shine, even as Thor is whittled down to his bare essential characteristics. But most importantly, Age of Ultron succeeds because of the dynamic between the Avengers themselves. There are no obvious stars or scene-stealers; the ensemble works because the core group is so well established that adding more doesn’t upset the status quo; it makes it richer. Some of the best moments in the film are ones where the team is put into a room and allowed to bounce off of one another. There’s an inherent chemistry that comes with these characters that makes it feel like they’ve been working together long enough to have a rhythm both on and off the field. Along with the epic comic book scale, it is this tone that makes this film so interesting to watch. On one hand, Ultron is very much an intimate look at these heroes and how they deal with the consequences of what they do. There are many mentions about making sure civilians aren’t in their path of destruction and that the heroes feel and live with the mistakes they’ve made. Scarlet Witch uses a nifty power to bring out the heroes’ worst fears, pulling them into nightmarish scenarios, reminding us that for all of their bravado, tech, muscle and skill, these superheroes are very much human (for the most part) and fallible beings. Put up against an action-packed and ripped from the comics’ backdrop, this grounded look at the Avengers creates a wonderful juxtaposition for who they are and what they do. Joss Whedon and cinematographer Ben Davis create some remarkable imagery, giving the cast a larger than life stage to perform on. All of the sequences with the Hulk are shot beautifully, he is wonderfully shown in both full destruction mode, highlighted by a scene that’s clearly meant to leave its mark, and the ones quieter in mood. The entire pre-credits sequence is gorgeous and shot with a fluidity that takes us from different points in the action to show how The Avengers now work as a team. Age of Ultron doesn’t quite capture the magic of its predecessor, and it does feel like a rather obvious bridge between the past and present, but that doesn’t ruin the enjoyable nature of the film or the aftershocks it’s likely going to leave. It’s worth a second viewing as well (which I can assure you I’ll be doing). It’s not perfect, but there are intrigue and good intent even in its flaws. The characters are well developed and acted with enthusiasm and, most importantly for this fan, still captivate me until I’m sucked in by the ongoings of these characters whose sole motivations and goals are to save innocent lives. Superhero fatigue hasn’t set in for me yet, and if Marvel continues to produce such high quality films, I don’t see it losing its magical effect too soon.